Oh, and charcoal is more of a deep green in daylight and indoors it's charcoal; believe me, weird but true. One thing that is very important to me is this style has an actual, movable tongue and is easy to put on and take off. The Arroyos fit perfectly and I find the full heel cup helps prevent debris from getting into the sandal. 4.0 out of 5 starsLike Having Hummer Tires On Your Feet!! 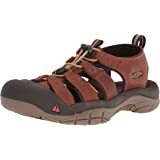 Over a period of about 3 weeks, I tried on the following hiking sandals before I settled on the Keen Arroyo II. 1. Thick, rugged tread on the sole of the sandals. Whether you're hiking black asphalt or red rock, these sandals will give you sure footing every time. I hope that in the Arroyo III's, they make the tread even more thick. 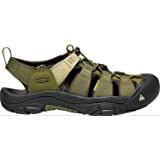 Keen Kreeks are the most comfortable sandals I've worn, but its sole is a joke. They look like they're made for city sidewalks not actual creeks. 2. 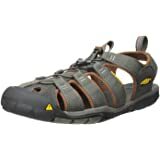 Strong toe protection, the Arroyo II has above average toe protection compared to the other models except for the Skechers Journeyman-Safaris and Keen Glisan. 3. Soft, fabric uppers that wrap your foot gently with added cushion and elastic support for comfort. Admittedly not as comfortable the the Keen Kreeks. I hope the Arroyo III's borrow the uppers from the Keen Kreek. 4. Supportive insole is nice, but not as nice as the Glisan model. In the Arroyo III, Keen should use the insole from the Glisan model. The Arroyo II's nearest competition is from the Glisan. The Glisan has excellent tread as well (though not as thick or ruggedly designed) and a better insole with actual cushion. However, the uppers of the Glisan are way too stiff to be comfortably worn on bare feet. The Glisans feel fine with socks. 2.0 out of 5 starsLOVED THEM, HATE THEM- Keen blew it on this one. I own a pair of Arroyo hiking sandals. They are about 4-5 years old and I love them. Just now one of the elastic draw cords broke but that is not a biggie to solve and is the first problem. On my newer pair of 2 yr old pair Arroyo II's there a really different problem. The II appears to be an upgraded version of the Arroyo. 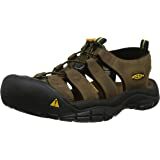 I wear the Arroyo all the time, in warm weather, for general work and exercise (dog) walking. 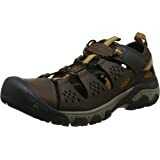 I got the new pair of the II's and moved them to daily dog walking and for being dressed in a newer more colorful hiking sandal. Here is the problem. The Arroyo II has a new fabric water resistant lining that is different than the original Arroyo. It is the Hydrophobic mesh lining. The lining at the heel cups wore out by the first month of the new (2nd) season. 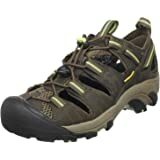 Remember this is a warm weather hiking shoe not a cold winter shoe. The heel fabric is worn through and the under construction of plastic and some fiber is exposed causing blisters on my heel unless I have on soxs. To me this is quality control issue where a new material was added to a shoe and it is not durable enough to hold up to normal wear. KEEN would not stand behind the shoe saying I was out of warranty even though I provided clear photos of the product failure. They did give me a 50% off coupon for any product sold from their web site. If they put a tag on their adds "will only last one season" who would ever buy them? I wanted to buy a new pair of these but ultimatly the product failure prevented me from doing so. Love their shoes (own 5 pairs) but not these. Several reviews said they ran large but I ordered my usual size and they fit. I compared them to my other shoes of the same size and they were the same size. The toe box has some room for my wide feet. It the first shoe I ever purchased where the height of the shoe hugs your feet in the toe box. The soles are okay but a little on the soft side so they may not hold up compared to more durable soles. This is my eighth pair of Keens. Love them - am always bashing my toes on something and these huge toe boxes really protect my feet. I have all manner of styles but these are my very favorite for walking. I usually wear a 10 but misread some reviews and decided to get the 10 1/2. Nope - too big so just exchanged for a 10. One thing that is very important to me is this style has an actual, movable tongue and is easy to put on and take off. Too many of the other styles just have an elasticized opening and it is much harder to get on and off (ie: Newports)- especially if you wear socks. Another added attraction is the heavy, lugged soles - very sturdy and good traction. I am sold on Keens. Well worth the price - in fact, what other pair of shoes lasts this long? 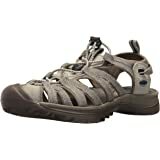 I love KEEN sandals and I bought this pair because it has a toe and solid heel as required at the place I work. They feel great, but the lace is not elastic so it doesn't give as your foot moves. I don't know why KEEN did this. I swapped out the laces with and old pair I had laying around. I quit buying NIKE because their quality went down, and I hope the same doesn't happen to KEEN. 5.0 out of 5 starsGreat, but get 1/2 size smaller. 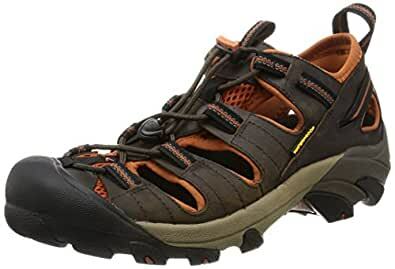 Without repeating the other's comments; I can say that I'm very happy with this sandalish hiker shoe. Very comfortable, good support, easy lacing, quality materials, and good looking too. Maybe because of its open design, it feels a little large on the feet. Especially if you're planning to use them without socks, definitely get it 1/2 size smaller. I'm only wearing them with socks for this reason (too late to return). Amazon's page states that this shoe fits "as expected", which is totally wrong. Even the manufacturer's site mentions that it's fits somewhat larger then its intended size (but I didn't see it before I ordered it). These sandals have a removable footbed, which means I can substitute my Superfeet insoles. No more foot pain after an hour or so on my feet! There may be other similar sandals with this feature, but I have not found them. Of course my feet get hot in summer if I don't wear socks, although the ventilation does help a bit. The solution -- wear socks if it's really hot -- at least if your style sense will allow you to do that. 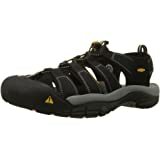 The Arroyo II is (for me) the perfect hiking/walking the dog/knocking around sandal. I'm going to buy another pair before they change it or stop making it.